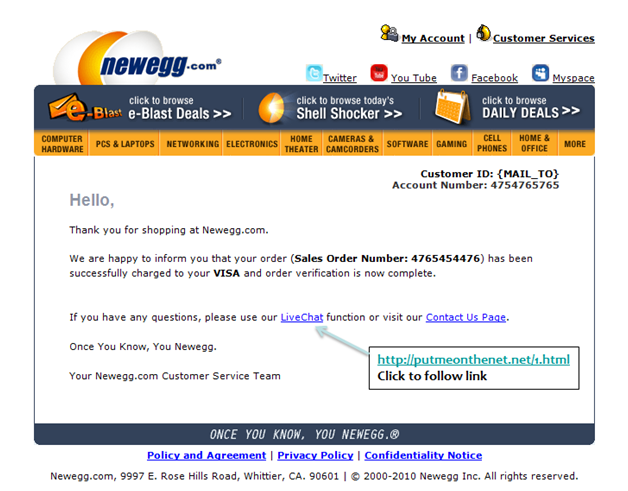 Your information is secure with Newegg. Newegg has become aware of fraudulent correspondence disguised as official Newegg correspondence. Newegg takes the security of customer information extremely seriously and wants to assure you that phishing communication is in no way affiliated with or originating from Newegg. Newegg will NEVER ask you for your password, financial or personal information in an e-mail communication. We have taken immediate steps to verify that no customer data has been breached and to inform the proper authorities. Rest assured your information is safe with us. A phishing email is a fake communication, disguised to look exactly like a genuine email from Newegg, which is designed to “fish” for information by luring unsuspecting recipients into divulging or verifying personal details, like bank accounts, addresses, names and more. Phishing scam artists can send fraudulent communication to millions of people at a time. If you have received phishing communication from someone pretending to be Newegg, this does not mean that Newegg’s data security has been breached. Newegg protects your information with sophisticated security measures, and the recent phishing scam did not compromise our data security. Notification regarding an order that was never really placed. Notification about possible account closure/suspension due to fraudulent activity on an account resulting in the need for account verification and/or a password change. A promotional email with links that take you somewhere other than Newegg.com. When you place your mouse over a link or pictures with links without clicking on it, a box will come up showing you where that link will take you. Legitimate Newegg links will always show “https://www.newegg.com”. Please note it is the .newegg.com (including the period before newegg.com) part that is the most important part to look for. If you see cs-newegg.com or newegg.accountmaintenance.com, they are not legitimate Newegg.com sites. The To: field in the email is blank, has multiple email addresses, or is addressed to somebody other than you. Your credit card number (including expiration date and credit card security code). Your Newegg.com user name and password. Your address, phone number, or other personal information. While this email looks like a genuine Newegg.com email, when you move your mouse cursor over the link, it will show a site that does not contain .newegg.com in it. To keep your personal information safe, please take a moment to look at where the link will take you before clicking on it. Newegg takes every security threat seriously and strives to ensure your purchases are as safe and secure as possible. Online scams and phishing attacks are unfortunately common occurrences across the industry and should be handled with extreme caution. If you have received a suspicious e-mail, we strongly advise that you DO NOT respond, download or click any of the links provided.